A BATTLING performance by Dumbarton won them a place in the last sixteen of the William Hill Scottish Cup in front of a 680 crowd at the Cheaper Insurance Direct Stadium. Top scorer Garry Fleming netted twice to Stevie Aitken's men a 2-21 victory over fellow Ladbrokes Championship side Queen of the South and a place in the fifth round. 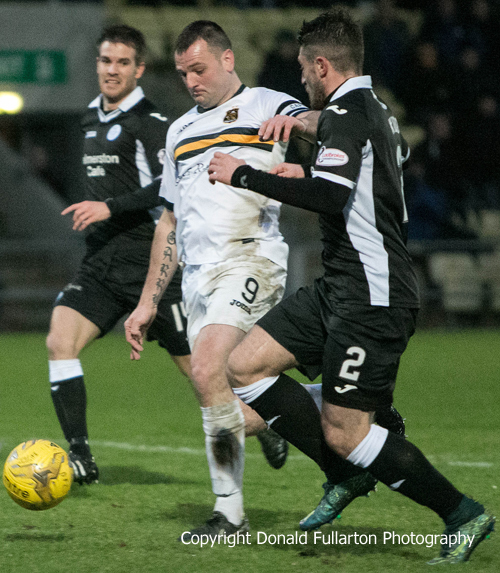 Thanks to Garry's double it the first time Dumbarton have beaten the Dumfries side at home since February 1992. He also became the first Sons player to score at home to the Doonhamers in over 20 years. His first goal came on 17 minutes after good build-up work from Steven Saunders. He found himself one-on-one with Queens keeper Robbie Thomson and slotted the ball home. Kevin Cawley came close with a powerful header, and Jon Routledge fired wide just short of half time. Sons came out firing on all cylinders after the break, with an early effort blocked well by the keeper. But it was the visitors who cored next, drawing level at 1-1 on 52 minutes. The goal came through Derek Lyle who headed home a corner. Five minutes later Dumbarton were in front again, as Cawley fed Fleming to fire home from close range for his and his team's second (pictured). It was tense at the end, as Queens threw everything into finding another goal. But Sons showed determination and resolve to secure their path into the next round of the Cup.